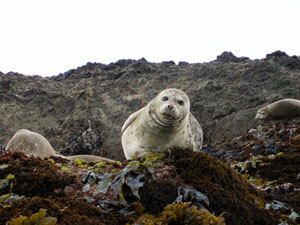 Welcome to Kayak Mendocino and the beautiful Mendocino coast of Northern California. 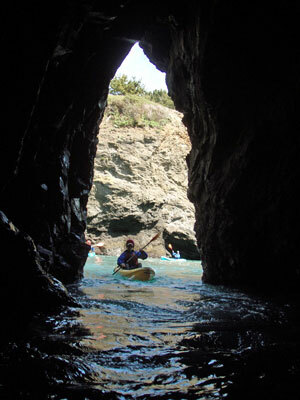 Here you will get professionally guided sea cave tours and more at Van Damme State park in Mendocino, while sitting on a sit on top Ocean Kayak. For the next hour and a half your life will take on that of a Marine Mammal, joining the Harbour Seals, Sea stars, algaes and Shorebirds in this incredibly rich and diverse habitat. All tours are easily paddled by beginners and require no prior experience, as Van Damme is a special place offering protection and channels in either direction. We stay within these areas to insure a smooth ride, while still being able to observe wave action on outer reefs. These tours are time tested and have been safely and happily paddled by thousands of people over the last 15 years. 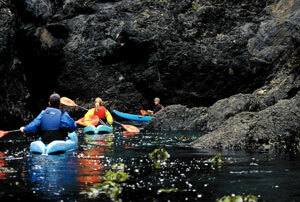 Our guided sea cave tours through the caves of Mendocino. Tours leave Van Damme State Park at 11:30am, and 2:00 pm with reservations daily. Walk ups are welcome, but reservations are preferred as space is limited. Purchase a Gift Certificate here.